Download "OUTLOOK 2007 2010 TIPS FOR BEGINNERS"
1 OUTLOOK TIPS FOR BEGINNERS GINI COURTER, PARTNER, TRIAD CONSULTING In this session you ll learn how to manage your calendar, , and tasks (basically, your work life) using Microsoft Outlook. We ll help you integrate shortcuts and tricks for Outlook into your work routine, and review the best practices for quickly and efficiently handling mail, scheduling appointments, and managing your ad hoc work using tasks and the To Do bar. DISPLAYING THE ADVANCED TOOLBAR The Advanced toolbar isn t advanced; it s just the commands that they couldn t fit on the Standard toolbar, commands that power users need. Right click the Standard toolbar and choose Advanced from the shortcut menu to display the Advanced toolbar. SHORTCUTS TO OUTLOOK APPLICATIONS OR FORMS The shortcut keys for Outlook are easy to remember: Ctrl+Shift and: I to jump to the Inbox N to create a new note C to create a new contact A for a new appointment K for a new task ORGANIZE YOUR DAY WITH THE TO-DO BAR In prior versions of Outlook, you often had to switch from the Calendar to Inbox to Tasks to see all of your action items. Many users simply quit using one or more of the Outlook folders to simplify their work. 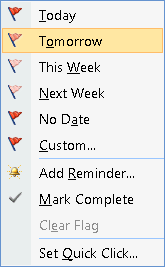 In Outlook 2007, all of your action items are displayed in the To-Do Bar on the right edge of the Outlook window, regardless of where you created the action item. The To-Do Bar is available in every Outlook view so you can organize and track your day s activities no matter where you are in Outlook. If To-Do Bar isn t visible, choose View > To-Do Bar from the Outlook menu to display the To-Do Bar. Click the double-arrow on the To-Do Bar to maximize or minimize the To-Do Bar. The To-Do Bar shows the following action items: Messages flagged for follow up from your Inbox Tasks from your Tasks list Upcoming appointments and meetings from your Calendar If you have action items from applications that integrate with Outlook such as Microsoft Project or SharePoint, those items will also be displayed in the To-Do Bar. 2 2 USING THE TO-DO BAR The To-Do Bar displays action items in the near future. Appointments and meetings are automatically removed from the To-Do Bar when their End Time is passed. Other items remain until you mark them complete or delete them. Right click the item and choose Mark Complete from the shortcut menu. REMEMBER THAT THE TO-DO BAR IS CREATED FROM EXISTING ITEMS (MESSAGES, TASKS, APPOINTMENTS). IF YOU DELETE THE TO-DO BAR ENTRY, YOU RE ALSO DELETING THE ITEM. CUSTOMIZING THE TO-DO BAR To customize the To-Do Bar right-click anywhere in the To-Do Bar title and choose Options from the shortcut menu to open the To-Do Bar Options dialog box. TIPS AND TRICKS FOR OUTLOOK TASKS When you task a-mail message for follow-up, it automatically appears in Outlook s task list (See Flag a Message for Follow Up under Tips and Tricks. You can also enter a task directly in Tasks. TO-DO LIST VIEW To see all of your flagged messages and your newly created tasks, use To-Do List view in Tasks. If you want to see only those tasks created independently of flagged messages, switch to Tasks view. Warning: If you delete a task in To-Do List view that is from an message, you are also deleting the message. If you want to keep the message, right-click the flag and either click Mark Complete or Clear Flag. TIPS AND TRICKS FOR THE OUTLOOK CALENDAR Many office professionals spend more time in the calendar than in any other part of Outlook. Here are some tips for using the Calendar. KEEP THE CALENDAR OPEN Instead of switching from your Inbox to your calendar right click the Calendar button in the Navigation Pane and choose Open in New Window. DISPLAY MULTIPLE DAYS Hold Shift and drag in the Date Navigator to select/display multiple contiguous days. Hold Ctrl and click to select/display multiple non-contiguous days. SHOW TWO TIME ZONES 1. With the calendar displayed in Day view, right click the time bar. 3 3 2. Choose Change Time Zone from the shortcut menu. 3. Turn on the Show an Additional Time Zone check box. 4. Choose the time zone. Click OK. REFLECT THE TIME ZONE IN AN APPOINTMENT FORM Whether you re flying from one time zone to another or setting appointments for meetings in another time zone, you ll like this new feature in Outlook With the appointment form open, click the Time Zones button on the Outlook ribbon to display time zone drop down lists in your appointment form. ADJUST YOUR DAY/WEEK/MONTH VIEW Use the drop-down View list on the Advanced toolbar or choose View Current View to select Day/Week/Month. Use the buttons on the Standard toolbar to choose whether to view 1, 5, 7 or 31 days at once. If you re viewing 1, 5 or 7 days, you can select dates from the Date Navigator at the right (it looks like months of calendar dates). If you re viewing 31 days, scroll (on the right) to see different dates. To see more months in the Date Navigator, drag the horizontal divider between the Date Navigator and the Task Pad below it. Select a date to view by clicking it (in the Date Navigator). Select multiple contiguous dates by dragging them. Select multiple non-contiguous dates using the CTRL key with a click on the dates you wish to see. Change to a different month by clicking the arrows at the top of the Date Navigator. DISPLAY TWO OR MORE CALENDARS To show more than one calendar, choose Calendar in the Navigation Pane to display the My Calendars list. Turn on the checkbox for the calendars you wish to display. You can display up to 30 calendars side by side. To overlay one calendar on another, click the arrow on the calendar tab. The second calendar is displayed as a transparent overlay so you can find open time slots shared by both calendars. Click the arrow button on the calendar tab turn off the overlay. SCHEDULE APPOINTMENTS WITHOUT USING A FORM 1. Switch to Day/Week/Month view and click the Date Navigator to open the day you want to schedule. 2. Click in the time slot that corresponds to the start time of the appointment you want to enter. 3. Type the name of the appointment, and then drag the bottom border of the appointment block down to its end time. The blue line next to the appointment marks that time as busy, and the alarm clock represents a reminder that you'll receive before the appointment. 4 4 SET A REMINDER 1. Double-click the appointment on the Calendar to open it. 2. Enable the Reminder check box to set the reminder. 3. Open the list of options in the Reminder field and choose a different duration. 4. Click Save and Close to close the Appointment form. SCHEDULING MEETINGS AND EVENTS PLAN A RECURRING MEETING 1. Open a new appointment form and enter information in the fields as usual or open an existing appointment by double-clicking it. 2. Click the Recurrence button on the form s Standard toolbar to set the recurrence pattern. 3. Choose Daily, Weekly, Monthly or Yearly from the options at the left. 4. Set the remaining recurrence options based on the original pattern you selected. 5. Click OK when you re done, then click Save and Close. SCHEDULE A MULTI-DAY EVENT 1. Open the Appointment form for a new or existing appointment. 2. Click the All Day Event check box. The time fields will disappear. 3. Enter the dates for the Start Time and the End Time of the event. 4. Enter other information as appropriate for this event. 5. If you're unavailable for the day or days in question, change the Show Times As field to Busy or Out of the Office. PLAN A MEETING WITH OTHERS ACCORDING TO AVAILABILITY 1. Switch to Calendar and click the Plan a Meeting button on the Advanced toolbar. 2. Click Invite Others and select the people, rooms and equipment you would like to have attend, either as Required, Optional, or Resources. Click OK. Outlook will go out to the network and get the other Invitees schedules to display in the Meeting Planner. Attendees with calendars unavailable to Outlook will show hash marks in the schedule window. 3. Enter a preferred Start and End Time for the meeting and click AutoPick to find the first available time for all invitees. 4. When you have decided on a time, click Make Meeting. 5. Enter the details about the meeting: Subject, Location, Reminders, and Categories. Enter additional information (like a list of items you d like attendees to bring) in the open text box. 6. Click Send to send messages to all Invitees. 5 5 When messages are returned with responses, open them in the Inbox, then return to the original appointment to view the Status of the responses by clicking the Attendee Availability tab. CREATE A GROUP SCHEDULE If your organization uses Outlook to schedule conference rooms and AV equipment, or if you have a group of people whose free/busy information you need to view frequently, check out the Group Schedule feature. To create a group schedule, choose Actions > View Group Schedules. Click the New button. Name the group schedule and click OK. Add people or resources to the group schedule. When you are finished, click OK. To view a group schedule, choose Actions > View Group Schedules and choose the schedule you wish to view. Note: the group schedules feature is discontinued in Outlook 2010 SHARE YOUR CALENDAR WITH OTHERS There are several ways to share your calendar. As in previous versions of Outlook you can give another person permission to view or modify your calendar. (See Understanding Permissions at the end of this handout for more information on making someone your delegate.) Outlook 2007 has two ways to share your calendar: by and online. SHARE YOUR CALENDAR BY You can send your calendar or any calendar you own -- in an message as a Calendar Snapshot. The calendar appears in the body of the so the recipient can easily print it. 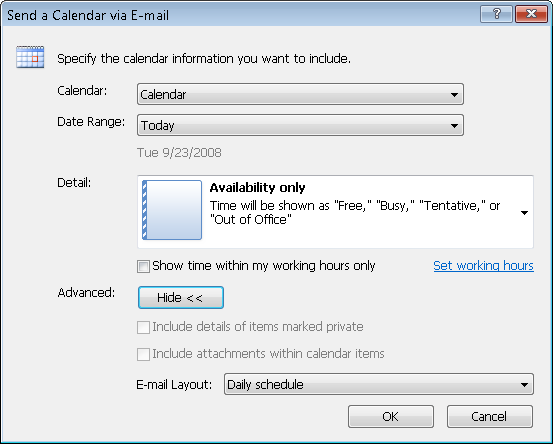 If your recipient uses Outlook 2007, they can open the attached calendar file as an Outlook calendar. With the calendar open, click the Send Via link in the Navigation Pane to open the dialog box. SHARE YOUR CALENDAR ONLINE Use the Microsoft Office Outlook Calendar Sharing Service to share calendars on online with other people. You control who views the calendar. Here are the steps: 1. In Calendar, in the Navigation Pane, right-click the calendar you want to publish. 2. On the shortcut menu, point to Publish to Internet, then choose Publish to Office Online. If this is the first time you have published a calendar to Office Online, you must register for Office Online by using your Windows Live ID account. If you do not have a free Windows Live ID account, you can create one. Follow the instructions on your screen. 3. In Time Span, select the number of days of calendar you want to share. 6 6 4. Click the arrow and choose the amount of Detail you want to share. Enable the Show Time Within My Working Hours Only check box to only share your working hours. To set working hours, choose Tools > Options. In the Options dialog box, click the Calendar Options button on the Preferences tab. 5. In Permissions, choose whether your calendar information can be viewed only by specified people or searched and viewed by anyone using Office Online. (If you are publishing a calendar that anyone can view, type a Description of the calendar so others can find it online.) 6. By default, the calendar will be periodically updated. Changes to the calendar are published to Office Online during the next manual or automatic send/receive. Calendars are updated every half hour. If you don t want to update this calendar, click the Advanced button and choose Single Upload: Updates will not be uploaded. 7. Click OK to close the dialog box and publish your calendar. 8. After your calendar is successfully shared on Office Online, you can invite people to view and subscribe to the calendar. Click Yes when prompted to send a sharing invitation. TIPS AND TRICKS CREATE A CONTACT FROM AN ADDRESS In an message, right click any addressee (To, From, Cc, Bcc) and choose Add to Contacts to open a Contact form. DELETE AN ADDRESS FROM THE AUTOCOMPLETE LIST When you begin typing an address or contact in the To, From, Cc, or Bcc boxes, Outlook displays an AutoComplete list. To remove an address from the list, simply select it and press Del. CREATE NEW ITEMS FROM EXISTING ITEMS Drop an message on the Calendar to create a new appointment and save the text of the message in the appointment form. (Attachments are not included.) Drop an message on Contacts to create a new contact for the sender and include the text of the message in their contact. (Attachments are not included.) INTEGRATION WITH A CONTACT OR DISTRIBUTION LIST Drag a contact or distribution list item and drop it on the Calendar to create a meeting with the contact. Drop a contact on the Inbox to address a message to the contact. Drop a contact on Tasks to assign a task to the contact. 7 7 Hold Ctrl and select multiple contacts to invite several people to a meeting or choose multiple recipients for a message. FLAG A MESSAGE FOR FOLLOW UP In Outlook 2007, a new Follow Up menu offers default time periods to choose from when you assign flags. Flagged messages appear in the To-Do Bar. In the Inbox, click the follow up column to set the Quick Click flag to the message. Right click the column to choose a different flag or add a reminder. Click any flag to mark the item as complete. (If you mark a flagged message as complete in the To Do List or Tasks list, it will automatically be marked complete here as well.) To assign your most frequently used flag to the Quick Click flag, right click the follow up column for any message and choose Set Quick Click from the shortcut menu. In previous versions of Outlook, you could set the colors of flags and use them to sort and filter your mail, appointments, tasks, and contacts. In Outlook 2007, you ll find that functionality, and more, in categories. ORGANIZE OUTLOOK WITH COLOR CATEGORIES Use Color Categories to easily identify and group associated items in Outlook. You can assign a color category to messages, notes, contacts, tasks, and appointments so you can easily organize them. In Outlook 2007, you can assign more than one color category to an item. The colors are displayed in table views like the Inbox, and at the top of the message, contact, or other item when it is open. You can create a color category system that works for you by renaming the categories. Tip: Use the Categorized Mail search folder (in the Search Folders list in the Navigation Pane) to view, sort, and group all your categorized mail items. A color category must be listed in the color category list before you can assign it. There are several default categories, for example Blue Category. Rename the existing categories and create new categories to give them meaning in the context of your organization and your work. ASSIGN A COLOR CATEGORY TO A MESSAGE To assign a color category to a message in any list view: 1. Right click the message. 2. Choose Categorize then the color category from the shortcut menu. To assign a color category to an open message: On the Message tab in the Options group, click Categorize then choose a color category. 8 8 RENAME OR CREATE A COLOR CATEGORY The first time that you assign a default color category to an item, you will be prompted to rename the category. You can also change the color of the category and choose a keyboard shortcut. You can set the colors for default categories and create new color categories in the Color Categories dialog box. 1. Click Categorize on the ribbon and choose All Categories from the menu. 2. Click New to open the Add New Category dialog box. 3. In the Name box, type a name for the new color category. 4. Click the Color down arrow, choose the color that you want, and then click OK. ORGANIZE MESSAGES WITH FOLDERS AND VIEWS Create folders in your Inbox then apply rules to automatically organize messages as they arrive. CREATE A FOLDER FOR MESSAGES 1. Select the Inbox. 2. Right click the Inbox and choose New Folder 3. Enter a name for the folder. SWITCH BETWEEN VIEWS To switch between views in any of the Outlook modules use the View List on the Advanced toolbar. (If the Advanced toolbar is not displayed, right click the Standard toolbar and choose Advanced.) Simply choose another view to apply it. You can also change views by clicking the View Menu and choosing Current View. Views for the active module are displayed at the top of the submenu, with the current view checked. SORT A TABLE VIEW Sort a table view alphabetically by clicking on a column heading. Click once to sort alphabetically A-Z and click again to sort Z-A. Hold Shift and click another heading for a multi-level sort. If you wish to define multilevel sorts, choose View Current View Customize Current View, and click the Sort button. Choose up to four fields to sort by in ascending or descending order. Clear the sorting order by clicking the Clear All Button. FILTER YOUR DATA 1. Choose View Current View Customize Current View. 2. Click the Filter button. 9 9 3. Search for specific words (names, companies, etc.) by entering the search criteria in the Search For Word(s) field. 4. Change the In Field drop down to indicate which field you expect to find the word for which you are searching. 5. Click OK to apply the filter. Then click OK again to close the dialog box. To apply more specific filters, click View Current View Customize Current View and then click the More Choices or Advanced tabs. More Choices lets you define specific categories on which to filter or identify items that you have not opened (like or notes posted by another user). The Advanced tab lets you define more complex filters by applying conditions such as contains, between, doesn t contain, is empty, etc. to the filters. It also lets you apply more than one filter to the data. Click OK twice when you re done. The status bar (bottom of the Outlook window, above the Start button) shows whether or not you re viewing filtered data. If the status bar isn t displayed, click the View Menu and choose Status Bar. ADD FIELDS TO A VIEW 1. Choose View Current View Customize Current View 2. Click the Fields Button. The Show Fields dialog box opens, allowing you to select fields from the list on the left and/or remove fields from the list on the right. 3. Select an item from the fields list on the right to activate the Move Up and Move Down buttons. Note the fields displayed are based on categorizes in a drop-down list at the bottom left of the dialog box. Change the drop down category to see other field choices. 4. Click OK twice to close both dialog boxes and see the changes you ve made. Changes are automatically saved. In other words, the current view is now a customized version. If you don t wish to overwrite the original view, simply name the new view by clicking in the View list and typing a new name, and then press Enter. If you don t name the custom view before switching to another view, the custom view overwrites the original view. If you wish to change the view back to its original settings, Choose View Current View Define Views, click the view you want to change back to its original settings and click Reset. Close the dialog box or select another view and click Apply View CREATE AND USE RULES is both a blessing and a curse in today s business environment. It takes precious time and careful review to sort it all out by hand. However, if you let Outlook Rules handle your mail for you, you never have to worry about missing an important message or wasting time on worthless spam. This section describes how to create rules you can apply to handle your everyday mail and rules that work for you while you re away on that welldeserved vacation. 10 10 USE COLORS TO ORGANIZE MESSAGES Colors are an easy way to distinguish Outlook items that share a common attribute. Although you can apply colors manually, the real power of colors comes when you create a rule to apply colors automatically. Using colors you can create rules to color messages from or sent to a specific person and clearly distinguish messages sent only to you. To apply colors automatically, follow these steps: 1. Open the Ways To Organize Inbox pane by choosing Tools > Organize from the menu. 2. Click the Using Colors tab in the Ways To Organize Inbox pane. 3. Click the Automatic Formatting button at the top right of the Ways To Organize Inbox pane. 4. Click the Add button in the Automatic Formatting dialog box to create a rule that Outlook temporarily names Untitled. 5. Type a descriptive name for the rule. 6. Click the Font button and choose a font. 7. Click the Condition button to open the Filter dialog box. In the three tabs of the dialog box, set the filter conditions. 8. Click OK to create the condition. CREATE A RULE BY EXAMPLE The easiest rules to create are those you create using the Organize pane. Using the Organize pane you can create rules to automatically move messages to an identified folder. In this type of rule, you can choose to automatically move messages from a specific sender or to a specific recipient. To create a rule using the Organize pane, follow these steps: 1. From the Inbox or other Mail folder, choose Tools > Organize or click the Organize button on the Standard toolbar to open the Ways To Organize Inbox pane. 2. Select the message you want to use as the example. For example, if you want to create a rule that automatically moves future messages from your supervisor to a folder named Important, select any current message from your supervisor. 3. Choose From or Sent To in the Create A Rule drop-down list to indicate which type of messages should be moved. If you don t have a message from your recipient in any of your mail folders, enter the person s name in the text box. 4. Use the Into drop-down list to select the folder where you want the messages to/from this person moved; if the folder doesn t exist, click the New Folder button at the top of the Organize pane and enter a name for the new folder. Click OK to create the folder. 5. Click the Create button to create the new rule. You know it worked because it says Done next to the Create button. The rule is applied to all new messages you receive. 11 11 USE JUNK MAIL AND ADULT CONTENT RULES With Outlook, you can automatically color or even move junk mail messages to the Junk folder or right to your Deleted Items folder if you prefer -- so you don t waste your time with them. To format junk or adult content messages, click the Junk tab in the Ways To Inbox Organize pane. Choose a color for each type of message (you can apply the same color to both), and then click the Turn On buttons. If you d prefer the messages were deleted or placed in a specific folder, choose Move from the dropdown list and then select the folder to which you would like the messages moved. USE THE RULES WIZARD TO CREATE COMPLEX RULES 1. Open the Inbox and choose Tools Rule and Alerts. 2. Click New Rule and choose to create a rule from one of the templates or Start with a Blank Rule. We recommend you use a template until you are comfortable creating rules. 3. Click an underlined value in the Rule Description to edit the rule. For example, if you are using the Move New Messages From Someone template, then click People or Distribution List and select the address of the person or distribution list that originates the mail. Then click Move It To The Specified Folder and select the folder you want to mail to move to. You can also create a new folder by clicking the New button on the Rules Wizard dialog box that opens. 4. After you specify the Rule Description, click Next. 5. Select any conditions you want checked before the rule is applied. For example, if you only want the mail from this sender moved to the folder you specified if it is addressed only to you, click the Sent Only To Me checkbox. You can apply several conditions to each rule you create. For example, From People or Distribution is already selected based on the template you chose in Step 2. If an additional value is required based on your choices, the value is underlined in the Rule Description section at the bottom. After you set the conditions and additional descriptions, click Next. 6. Choose what you want to do with the message. In the example we are using, Move It To the Specified folder is already selected. You can choose to also have it forwarded to someone else, notify you with a specific message or a number of other actions. Remember to identify any values in the Rule Description box if the action you choose requires more detail. Click Next. 7. Identify any exceptions to the rule. For example, perhaps you don t want the message moved to the specified folder if it is marked with High Importance. To designate this, select the Except If It Is Marked As Importance exception. After you set any exceptions, click Next. 8. Enter a name for the rule and indicate if you would like to run the rule immediately on messages in the Inbox. This is a great way to test the rule to see that it does what you want it to. Click Finish to return to the first Rules Wizard screen. 9. Repeat steps 2-8 to create additional rules. You can change the order in which rules are processed so that a message that might be affected by more than one rule is handled on a priority basis. Click the Move Up and Move Down buttons to rearrange rules.